WebSphere Message Broker version 8 is out! Hot on the heels of the latest goodness in WebSphere MQ, it’s the turn of IBM’s Enterprise Service Bus – WebSphere Message Broker – to get a major new update. WMB v8.0 was announced back in early October and has just arrived ready for download in versions for distributed platforms, System z mainframes, and as a Hypervisor Edition for Linux and AIX (to be provisioned via the IBM Workload Deployer appliance). Version 8 brings a number of enhancements to the development experience, but one worth highlighting is what we call “Apps and Libs” – the idea that sets of message flows may be grouped into a unit called an Application which can be deployed, stopped and started as a whole. With Libraries, there are also truly re-usable assets like .esql files, or sub-flows, which can be deployed and updated separately, and invoked dynamically at runtime. This is a key change in the way that the Broker works – previously, sub-flows were compiled into the main flow and changing one required redeployment of all flows using it… they are now dynamically linked when needed, so they can be deployed and replaced more easily. A new Data Format Description Language (DFDL, which you’ll sometimes hear called “daffodil”) enables any text or binary data to be understood within the message model. The Broker has had the “MRM” for many years, so of course could already do this, but DFDL is a new industry standard which can supersede the MRM (of course, you can continue to use your existing flows and message formats – you’re not forced to use DFDL). There’s a new mapper, too. More importantly, coming along with DFDL and the mapper is a really, really nice set of utilities for testing message models inside the Toolkit – you’ll now be able to confirm that the model matches the test data without having to go through a full model->deploy-> test-at-runtime cycle. I saw this demo’ed at the WebSphere Technical Conference in Berlin during October and was blown away by it – it would have saved me a lot of time back in my consulting days! 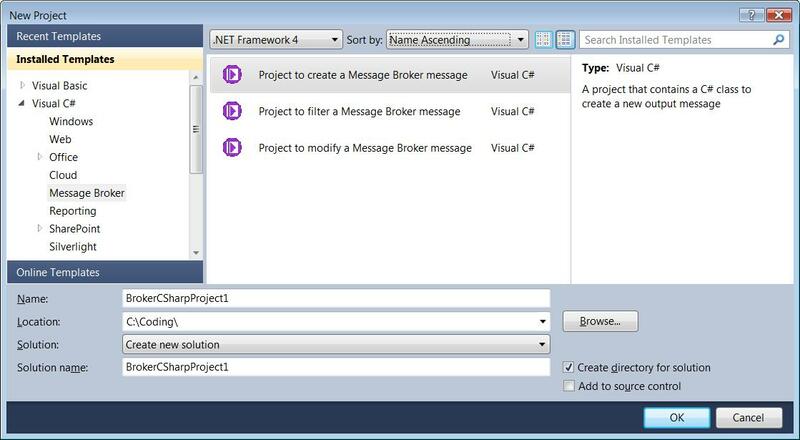 If you have .NET applications, assemblies, or services on the Windows platform, and you want to access those from your message flows – you can. 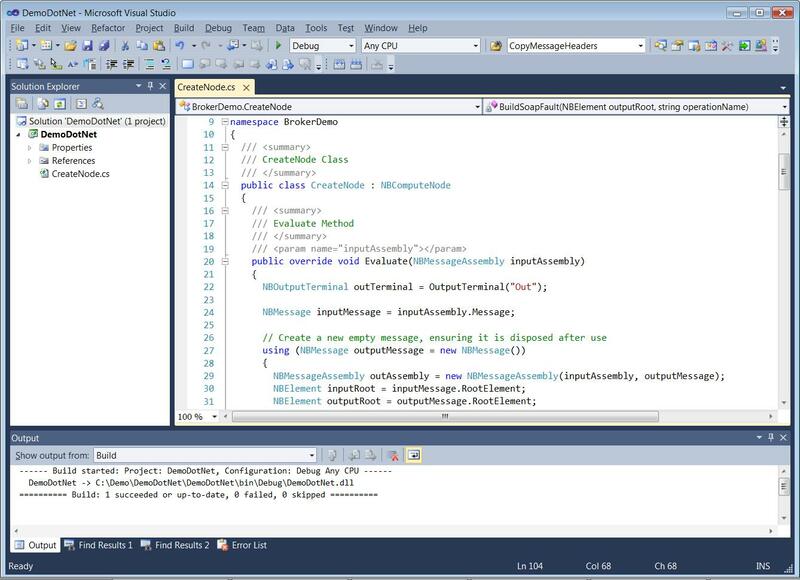 If you want to write your message flow logic using C# or VB.NET or any .NET 4.0 CLR-supported language, using Visual Studio – you can. If you don’t know how to get started with this stuff, the Toolkit has a new .NET Pattern to lead you by the hand and get you going quickly, and project wizards for Visual Studio. So, if you want a high-performance ESB platform that connects “anything to anything”, with minimal need to learn new skills, and run it on Windows with deep .NET integration – this release is going to cover your requirements. Delivered in version 8 is a first stage in making the Broker more easy to administer from a lightweight client – a web browser. Whilst power users and existing administrators can continue to use the Message Broker Explorer GUI, there is now an easy way to enable an optional web interface for basic administration tasks. Continuing the theme of simplicity the product has followed for a while, no additional moving parts (app or web servers) are required! Version 8.0 provides read-only views of running Applications and access to the log – more capabilities will be rolled into this interface in the future. 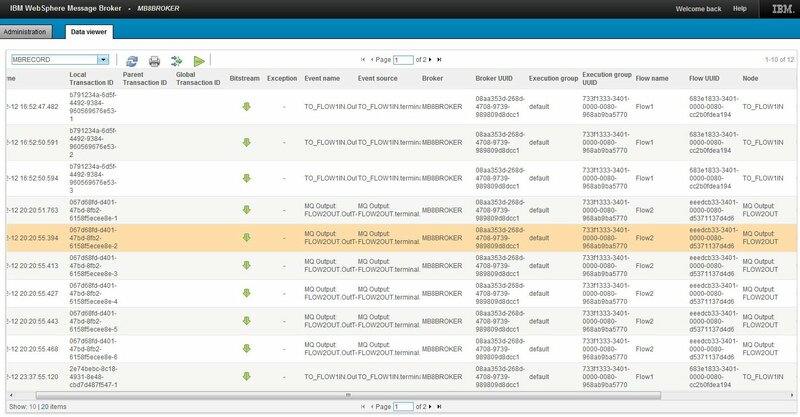 Sometimes, when you are dealing with a set of end-to-end flows of data between applications, you may want the capability to record what is going on, and to replay specific scenarios and sets of events. This could be the case in audit, test, and many other scenarios. Another of the massive enhancements in version 8 is the Broker’s response to this requirement – again delivered using the same simple, lightweight interface offered by the web administration tool. This also builds on technology around monitoring that has been progressively built into the Broker over the past couple of releases, so there are some really solid foundations and it is straightforward to set up. Just as I highlighted in my piece about WebSphere MQ 7.1, the Hursley teams have been strongly focused on “consumability” (translation for non-IBM-speakers = UX) for a number of years now. WMB continues to add capabilities that make it a richer, stronger integration platform, but also smooths out rough edges seen in earlier releases and is just… well… more productive to use. There’s even a drive to reduce the jargon and make the Broker logs more easy to understand, with new Activity Logging which aims to explain what a flow is doing in plain language (“GET message queue X”, “Update DB table Z”, and so on). Taken together, the new wizards, web interfaces, integrated testing tools, message modelling tools, reduced dependencies, lightweight deployment with apps and libs… the combination just makes it a much more enjoyable experience for developer and administrators. And there’s a new installer, too. The “papercuts” and node additions lists are huge: new JMSReceive node; new options for the File nodes; new Connect:Direct nodes; WS-ReliableMessaging support in the SOAP nodes; ability to install without root privileges; dynamic configuration of services without the need to restart execution groups… the list just goes on! Check out the product Information Center for more details on all of the features I just don’t have space to list. Footnote: version 8.0 is friendly to developers who use Ubuntu, too! 🙂 Anton (my go-to guy on all things Debian – listen to him!) has some good advice about running WMB or WMQ on Ubuntu and Debian. This entry was posted in blog and tagged .NET, dotNET, Enterprise Service Bus, ESB, hursley, IBM, IBM WebSphere, IBM WebSphere Message Broker, integration, WebSphere, WebSphere Message Broker, WebSphere Technical Conference, windows, WMB, WMQ. Bookmark the permalink. Nice Article Andy, what about WS-RM and Activity logging? What about them, Manu? 🙂 I covered both under “Richer, yet easier to use” – see references to Activity Logging and WS-ReliableMessaging (with a link to an explanation about the latter) in that section! Hi, thanks for the article and the news. A question, the version 8 has support for MYSQL database? I downloaded the trial from IBM’s site but while installing I dont find the toolkit anywhere. Can you please tell me where do I download the MB Toolkit? Best thing to do would be to ask IBM directly (I no longer work at Hursley). You could do that via mqseries.net or one of the IBM MQ/Broker accounts on Twitter, or via their support pages. It’s also not really appropriate to ask the same question of me here, and on an unrelated post on Google Plus – thanks. When you go to the trial downloads page and get to the part where you select your platform, the Message Brokers are at the top but if you scroll all the way to the bottom, there are the toolkit downloads. @Andy: Sorry about asking on G+. @Rob: I cant find it there. Please share the link with me. @Ankit, it’s behind a registration page so I can’t share the direct link. However, go here: http://www.ibm.com/developerworks/websphere/downloads/ and select “WebSphere Message Broker” from the list. Then click the green Download button and sign in. The next page after a successful sign-in is a selection of downloads. At the top are all the broker downloads sorted by platform and at the bottom are the broker toolkit downloads, also by platform. First at all, thanks for this great article! I’m a really excited about this new version of Message Broker (i’ve been working with Message Broker from version 5 :D) so now i’m planning to install it but i have a silly question… is it possible to install Message Broker v8.0 with MQ v7.1? i mean, i read the pre-requisites and the supported level for MQ is v7.0.1, but though that, can i do that? or should i wait for a fix for MB that support MQ v7.1? Support for WMQ v7.1 is expected in the next WMB FixPack. According to the Planned Release Dates page (http://ibm.co/Mkmyms) that is expected in 2Q12 – which is ending any day now. Look for a download to be available soon. We are just now installing version 8, and want to move flows to production. We are finding Mapping nodes and .msgmap files to be a sticking point. We need to be able to update these from time to time. What methods for handling these, or workarounds, have you or any of your readers worked out?